Announcements about the Taulbee Survey. 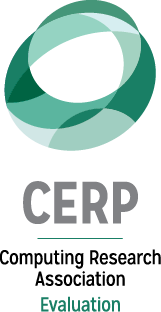 As always, thanks for your work on the survey, and please contact Betsy Bizot (bizot@cra.org or 202-266-2943) if you have any questions. By September 17: All doctoral departments will be contacted to update Taulbee user information. The academic unit head will receive an email and so will the Taulbee primary contact, if separate. Pdf will be available for data gathering. 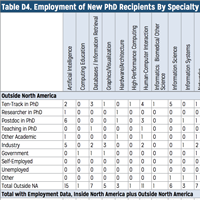 In the report of the CRA Taulbee Survey published in the May 2018 CRN, there is an error in specialty area labeling in Tables D4 (Employment of New PhD Recipients by Specialty) and D4a (Detail of Industry Employment). In both D4 and D4a, the column labels for High Performance Computing and Human Computer Interaction were swapped. In addition, in D4a the column labels in alphabetical sequence between Informatics: Biomedical/Other Science and Social Computing/Social Informatics were incorrect. The salary report is available for academic units that completed the salary section of the survey. 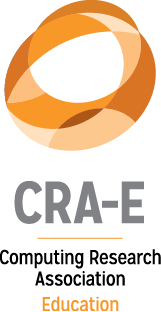 Taulbee users in responding academic units can download the report from within the CRA Taulbee system at https://taulbee.cra.org. The deadline for the main Taulbee Survey, collecting student and faculty data, has been extended to January 16 for all academic units. The one-time teaching position survey is collecting information about academic unit policies and practices concerning full time teaching faculty who are not on the traditional tenure track. The due date is January 22. Results from this survey will be made public later this year. 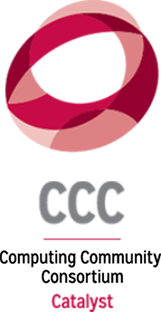 In fall 2017, CRA will be conducting the usual Taulbee Survey and a one-time Teaching Faculty Survey. The Taulbee Survey schedule will be as follows. By September 8: All doctoral departments will be contacted to update Taulbee user information. The academic unit head will receive an email and so will the Taulbee primary contact, if separate. September 13: PDF will be available for data gathering. September 19: Salary section opens for input. September 25: Main section opens for input. November 20: Due date for salary section. December 18: Preliminary salary report available to participants. January 8, 2018: Due date for the main Taulbee section. April 2018: Full Taulbee report to CRA members and participating departments. May 2018: Published in CRN. The CRA Taulbee Survey is in progress. The deadline for the salary section is November 18 and the deadline for the rest of the survey is January 18, 2017. If you are the academic unit head of a U.S. or Canadian department granting doctoral degrees in Computer Science, Computer Engineering, and/or Information, you should have received emails about the survey. If you did not, please check with the CRA Director of Statistics, Dr. Betsy Bizot, at bizot@cra.org. The 2016 CRA Taulbee Survey will be starting soon. As we did last year, the survey will be split into two parts, salary and main (everything else). This allows us to set an earlier deadline for the salary section in order to produce a preliminary salary report in December, while giving departments more time to collect and enter the information in the rest of the survey. By September 9: All doctoral departments will be contacted to update Taulbee user information. The academic unit head will receive an email and so will the Taulbee primary contact, if separate. September 27: Both sections of the Taulbee will open for input. November 18: Due date for salary section. December 19: Preliminary salary report available. January 18, 2017: Due date for the main Taulbee section. April 2017: Full Taulbee report to CRA members and participating departments. May 2017: Published in CRN. The 2015 Taulbee Report will be published in the May 2016 issue of CRN. 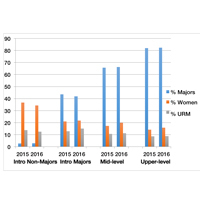 As we have done for the past several years, we are providing a preview of the degree and enrollment numbers for bachelor’s and doctoral level programs in the departments responding to the survey. The total number of Ph.D.s awarded declined by 8.2 percent, from 1,940 from the departments responding in 2014 to 1,780 from the departments responding in 2015. Since the set of departments reporting from one year to the next varies, for understanding enrollment trends it is of interest to focus on the set of departments that reported in both years.